These days, with spare time and square footage at a premium, many people are ditching the formal dining room and celebrating the kitchen as the hub for not just cooking but eating as well. A smart and beautiful dining island can serve all your kitchen and dining room needs, helping you really get the best of both worlds. 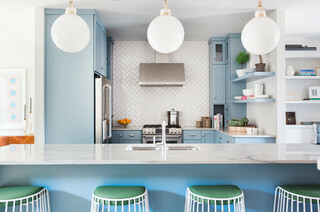 Whether you’re fully renovating or looking for a quick update, you can use some of these tips to incorporate dining into your kitchen island without compromising your work space or your style. Comfortable dining also requires a little elbow room. The fact that your island technically can fit a certain number of seats doesn’t mean that that many people can sit comfortably without knocking into each other. The typical shoulder width of a person is 24 inches, but try to give each seat closer to 30 inches if you can. 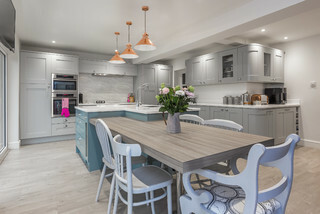 Note: Adding an island extension at a lower level makes the surface a little less convenient as extra counter space but more comfortable as a dining table, a trade-off that ultimately comes down to personal preference. 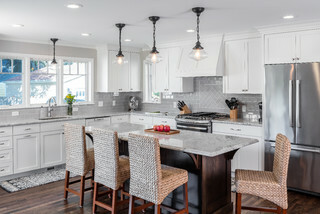 For more tips and examples of using kitchen islands as dining tables, check out this slideshow from houzz.com, then call Ray Floyd at Re-Builders, Inc. to begin your kitchen remodel on the Grand Strand in South Carolina. Call 843-448-0041.